This pattern includes nine beetles, everything from the cutest ladybug to the scariest rhinoceros beetle. With beetles, the colors you can use are limitless, and it opens up a whole new world of fabric possibilities to imitate the wing cover textures (lamé, UltraSuede®, leather, etc.!) This pattern would also be perfect for embellishing children's clothing, especially on t-shirts or sweatshirts! The quilt in this photo is 37" x 37". The largest beetle is 10" high by 5" wide. 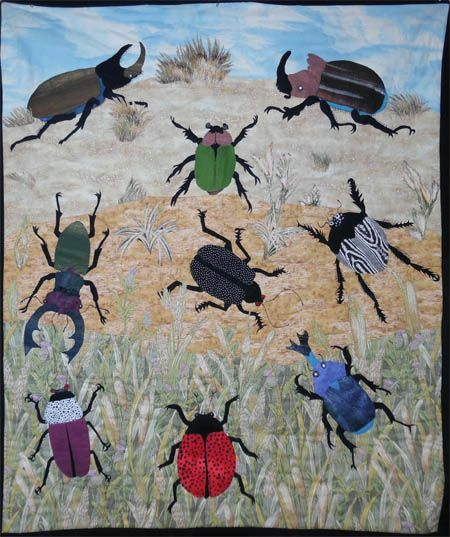 Your quilt could be totally different in size depending on how you arrange the beetles and how many non-appliqued blocks you include in your quilt top. Our son, Marc, made this quilt when he was working with us when he was 25. Why are there triangles added to some of the blocks, you might ask. Marc was squaring up the blocks and didn't realize there were two blocks stacked together and he sliced into a the hidden block that became an "oops!". We covered up the mistake with a triangle. Other triangles were added to balance out the goof, and the quilt became better for it. This pattern is only available to be mailed, (not available as a PDF pattern). I made a beetle for my white wool jacket using different techniques: needle punch and beading and appliqued it to the sleeve. This quilt was made for Quilter's Cove Quilt Shop in Newport OR as an alternative to the CPW pattern cover quilt.